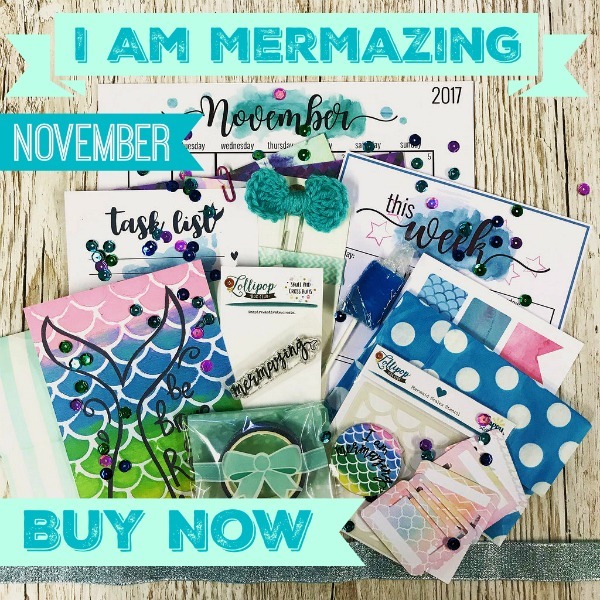 You are Mermazing!! Yes you are!! During November we will be celebrating how Mermazing we all are. The month is full of sparkle, beauty, stunning colours and positivity. We will be tackling challenges and believing in ourselves. It’s going to be a ‘mermazing’ month!! You will be receiving lots and lots of treats including…. An exclusive stamp and stencil, exclusive printable lists, month calendars, planner lists, an embellishment postcard, a postcard created by Jennifer from Happy Scatter and also a badge made by Jennifer, a large crotchet planner clip, page markers handmade by My Pretty Week, sparkly washi tape (colors vary), patterned papers (designs vary) a mini DIY Kit, 2 mystery gifts this month, a bag of treats …Plus lots and lots of mermaid treats. There’s so much that I’m holding back on and you’ll just have to wait until you receive your kit to find out. If you would like to subscribe, please do so here. We also have one off kits available here. Subscribers receive their kit at a discounted price and also receive extras in their kits. A limited amount of kits are available each month. All November kits will be shipped after the middle of November.